Tech News Realme 2 launching today in India | Price under 10000rs. Realme 2 launching today in India | Price under 10000rs. After the teaser is released on Flipkart, Realme Company has confirmed that Realme2 will be sold exclusively through e-commerce site Flipkart. At the same time, when Realme 1 was launched at the beginning of this year, then it was sold through Amazon. Along with this, the company has also disclosed the prices of Realme 2. The price of the phone will be less than Rs. 10,000. The company is going to give Nokia display at such a low price. 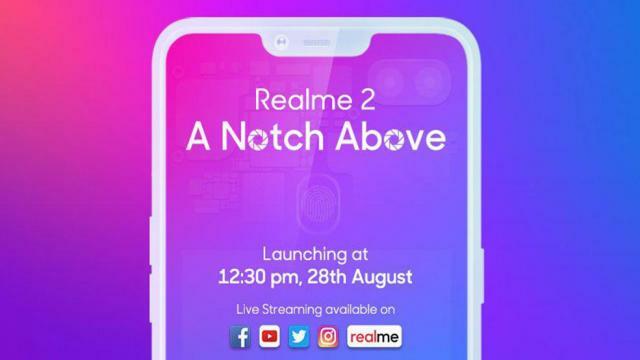 The launch event of Realme 2 will be on August 28 in India. This will be the second phone of the Oppo brand of Realme. In this phone, the company is giving a dual setup camera. Apart from this, there will also be a rear fingerprint sensor. People in this phone will get 4230 mAh battery. This will be 20 percent higher than the previous phone. Talk about the color variants of the phone, it will be available in the Diamond Red, Black, and Blue colors. Apart from this, the company's trademark diamond cut will also be seen in the back of the phone.